Also added to the line-up at the event - staged on the Isle Of Wight in September - are Disclosure, current chart-toppers Clean Bandit and Brits critics' choice award winner Sam Smith. The event, which has a "desert island disco" theme this year from September 4 to 7, has previously announced that reunited hip-hop act OutKast are to headline the Friday evening on the main stage. Beck will top the bill on Thursday, with Foals - who first played the festival in 2007 - unveiled as the main draw on Saturday. Other newly added performers include Wild Beasts, Chvrches and Laura Mvula. 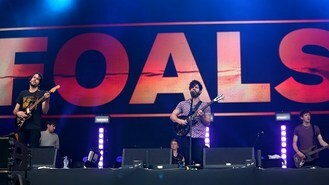 Organiser and Radio 1 presenter Rob da Bank said: " Foals were voted best live act of last year and I'm delighted they'll be headlining the Saturday night - there's no better indie guitar band in the UK right now. "Also donning a grass skirt and mirrorball is a total icon of popular music and one of my favourite songwriters, Beck." Further details of the event are at www.bestival.net.